When it comes to cooling your hardware, nothing beats water cooling. It not only offers superior performance in almost all cases to air cooling but also provides you with ultimate bragging rights. Most people are averse to water cooling, however, thinking it’s too hard or too dangerous. This is where the water cooling AIO comes in. AIO stands for all in one and is a type of water cooling that requires almost no setup. The pump, tubing, radiator, and even fans come all set up for you. All you have to do is put it on your CPU. 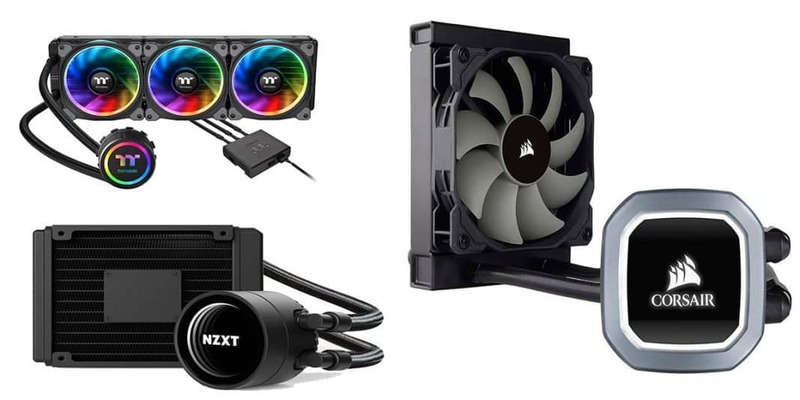 Below we’ve hand-picked and reviewed four of the best water cooling AIOs out there to get your new water cooled rig up and running. We’ve also included a small guide to help you know exactly what you’re looking for. The first one on the list we’re looking at is the most powerful and, subjectively, the most stylish. The Thermaltake Floe comes in three different sizes, either 240mm, 280mm, or the massive 360mm. 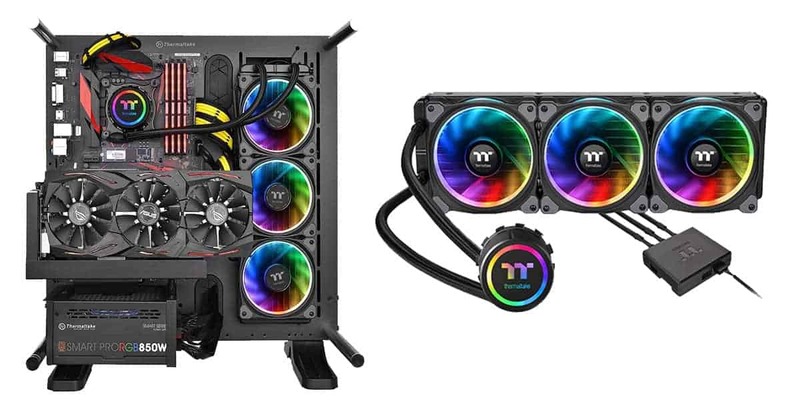 Both the 240mm and 280mm versions come with two of Thermaltake’s Riing fans included, while the 360mm version comes with three. These fans are static pressure optimized so they can easily push air through the radiator, and each one packs 12 individually addressable RGB lights that can produce up to 16.8 million different colors each. The water block has an additional six RGB lights, and all of them can be wired to the included digital controller. This allows you to customize your PC’s lighting using the Riing plus software. The software has tons of customization options, including a huge variety of colors and modes, including a music mode and even one that changes the color of the lights based on your CPU’s temperature. This cooler is compatible with effectively all Intel and AMD sockets, meaning you won’t have to worry about making sure the water block will fit your CPU or motherboard when buying it. On top of all of these features, this AIO is also impressively quiet. Even the huge triple fan 360mm version produces practically no noise when under an intense CPU load. If you’re looking for the most powerful cooler or one that offers tons of RGB lighting and customization, then the Thermaltake Floe is for you. No, you did not read that heading wrong, this AIO actually has a 1.77-inch full-color OLED display on the water block. ASUS is known for making high end and shockingly innovative products under its Republic of Gamers product line, and this ROG water cooler is no exception. The ASUS RYOU AIO is has a 240mm radiator with two included fans, which offers ample cooling for most CPUs outside of intense overclocking. The radiator fins are impressively dense, and when paired with the ASUS model 12 fans offers downright impressive cool. Where this thing really grabs people’s attention, however, is with the built-in OLED screen. The circular screen shines from the top of the block and pump and can be customized in ASUS’s software to display any image you desire. Or, even more, interesting in my opinion, is that is can be set up to display your system’s temperatures and fan speeds so you always know how your CPU and cooling are performing. Below the screen the pump also has a ring of RGB lights that can be controlled using ASUS’s excellent Aura Sync software, meaning you can coordinate the lighting with other ASUS Aura Sync compatible parts. While the fans are powerful and do a great job of pushing air through the dense 240mm radiator, they can also get quite loud when under load. If having a constant eye on your CPU’s vitals is a must for you, then this is the AIO you need. 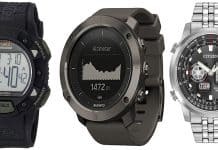 The OLED screen will let you continually monitor your processor’s temperature, clock speed, and more. NZXT became known for their quality cases years ago, but their more recent products outside of cases have been just as high-quality. The NZXT Kraken is available in an array of sizes. The smallest size offered is the diminutive 120mm single fan version, while the largest is a full 360mm. What all of these share in common though is a very thick radiator. The 120mm variant comes with a 32mm thick radiator, while the larger ones are slightly smaller at 30mm. Thicker radiators offer better cooling by allowing more surface area for the air to come into contact with. The problem with this, however, is that there is more back pressure pushing against the air, so the fans must work harder. Luckily, NZXT has provided the excellent Aer P fans with their AIOs, which offers excellent static pressure while remaining impressively quiet. 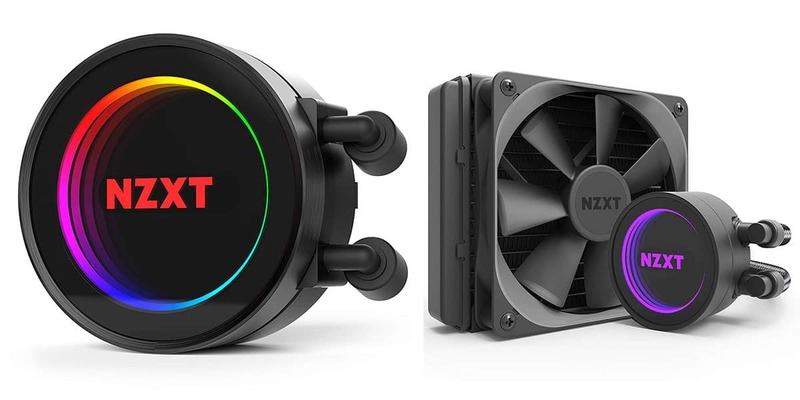 As to be expected from a tech company in 2019, NZXT included RGB lights in their AIO. The front of the very aesthetically pleasing water block boasts a beautiful infinity mirror design that creates a very cool effect when paired with the customizable RGB lighting. If space isn’t a prime concern in your case, and you want a simple yet beautiful AIO that offers superb performance, then the NZXT Kraken has a lot to offer you. 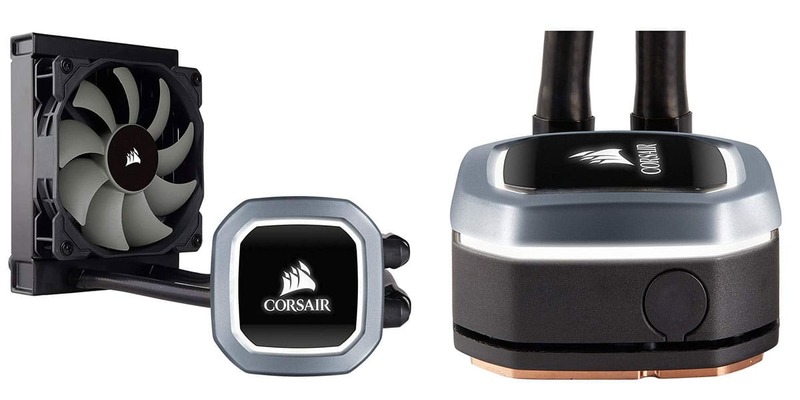 If you’re looking for a highly affordable water cooling AIO, or one to put into a relatively small form factor case, then the Corsair Hydro series H60 is your best bet. This is not only the most affordable AIO in our roundup, but also the thinnest. The radiator on this AIO measures a mere 27mm in thickness, making it much easier to fit inside of small form factor cases. As mentioned, the drawback to this thin design is that it does not offer the same level of cooling as a thicker radiator since there is less space for air to pass over and cool the liquid inside. This, combined with the 120mm size and single fan means the H60 offers the least cool of all the AIOs we reviewed. That being said, it is still no slouch. This AIO is more than capable of cooling a powerful CPU, and is undoubtedly better than air cooling in small form factor case where the temperature inside the case itself quickly rises, and large heatsinks are not an option. Despite this less than optimal cool, this is a great AIO for beginners. The water block is easy to mount and fits on a decent variety of sockets. The included modular mounting hardware requires no tools and can be set up in minutes. While it may not be ideal for huge CPUs like Threadripper, or heavily overclocked hardware, the included fan is powerful enough to offer reasonable cooling. 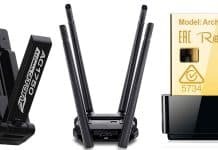 There are essentially three main parts to an AIO. The pump, the radiator, and the fans. The main thing to look at to determine how well a given AIO will cool your system is the type of radiator and number of fans. The radiator size and number of fans are closely linked. The smallest radiator is 120mm, and can only fit one 120mm fan per side. 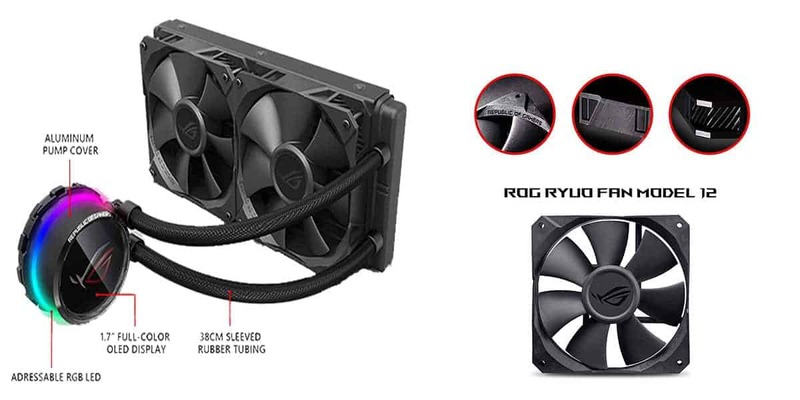 Moving up is the 240mm radiator, which holds 2 fans, and 360mm radiators which can hold 3 fans. There are also some in between sizes, namely the single fan 140mm and the dual fan 280mm. The bigger the radiator is, the more heat it will be able to dissipate from the water before it is sent back through the loop to pick up heat from the CPU again. The thickness of the radiator is also a factor, as thicker radiators allow more time for the air passing over the fins to cool the liquid inside. Picking a large and thick radiator, like the Thermaltake Floe is best if you plan to overclock your CPU or want maximum cooling. It is also important when picking an AIO to ensure the one you buy will be compatible with your case and motherboard. 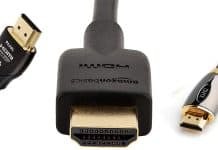 You can check what kind of CPU socket your motherboard has with our chart at the top of this article to ensure compatibility. 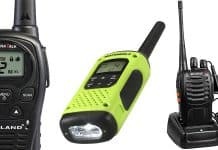 As for case, it changes on a case by case (see what we did there) basis, so you will simply have to consult your manual. What is a static pressure optimized fan? Static pressure optimized fans are designed to push the air as hard as possible. This is different from more typical case fans, which are intended to push as much volume of air as possible, but not push it hard. This is important for AIOs because the radiator resists the air passing through it. This means your fans have to work harder to get air through to cool the liquid. Will water cooling make a lot of noise? Not at all, in fact, many people turn to water cooling as a way to make their PC quieter. Since the pump of your AIO is literally submerged in water, it produces almost no audible noise. Also, the cooler temperatures that it can provide means your fans will run at a lower RPM, producing less noise. If you’ve thought about water cooling, but are too afraid due to the complexity or risk, then fear not. Water cooling AIOs offer the performance of cool without the hassle (and with a warranty). Water cooling has a plethora of advantages including cooler temperatures, less noise, and of course bragging rights over your friends and their inferior computers. However, these advantages used to be exclusively available to the people who put in huge amounts of money and time into making a custom water cool loop. Luckily, things are no longer like that today thanks to water cooling AIOs. We hope our reviews and guide have given you a clear idea of what kind of AIO you need for your computer. If not, please leave a comment down below and we’d be more than happy to answer any questions you may have.